Humans are a protective species. We like to hoard away our precious items in vaults and safes made of concrete and steel, safe from thieves and catastrophes. One not-so-obvious precious item, which many people take for granted, is seed. Without seeds, farmers would not be able to grow the grains, legumes, vegetables and fruits we eat. For centuries, farmers have harvested seeds to store and protect for planting the following year. Most of the time, farmers will only keep seeds harvested from plants that have excelled in their environment – that have produced high yields or have favourable qualities such as larger or tastier grain. This simple iterative process of selecting primarily for high yields means that many crops today are closely related genetically, which can make them more vulnerable to evolving diseases and pests. Without diversity, a severe epidemic can completely wipe out a farmer’s crop — and even a whole region’s crop. One of the best-known historical examples of just such a disastrous crop failure is the Irish Potato Famine of the 19th century, when potato blight disease caused extensive death, human suffering and social upheaval. A number of crops around the world are in similar danger today, including wheat, threatened by the Ug99 strain of stem rust disease, to which almost all the world’s wheat is susceptible, and cassava, menaced by African cassava mosaic virus (ACMV). Plant breeders are looking at ways to increase diversity among cultivated crops, mitigating the risks of pests and diseases and introducing genes that help plants thrive in their local environments. To do this they are looking for useful traits in traditional cultivars, related species and wild ancestors. Such traits may include tolerance to drought, heat, and poor soils as well as insect and disease resistance. Breeders cross these donor parents with high-yielding elite breeding lines. The resulting new varieties have all the preferred traits of their parents and none of the deficiencies. 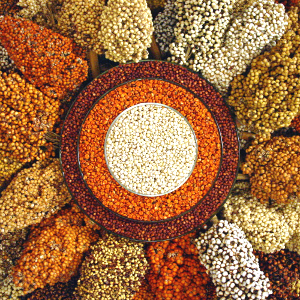 The genetic diversity of crops and their wild relatives is held by gene banks. There are thousands of gene banks worldwide, which collect and store seeds from hundreds of thousands of varieties. Breeders and researchers submit seed and tissue of wild and cultivated varieties as well as of lines of new varieties they are trying to breed. 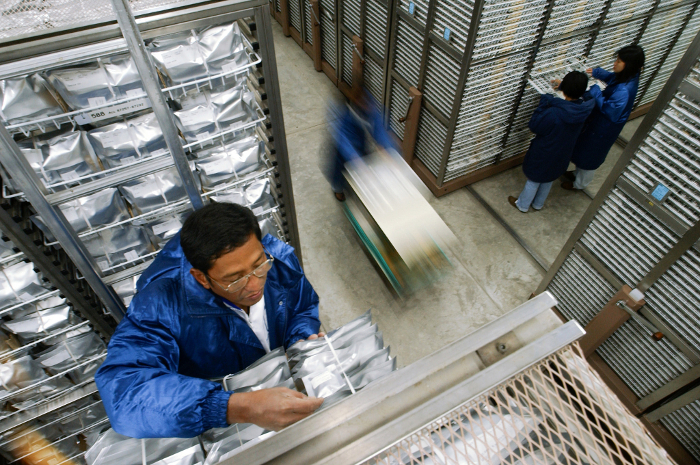 Staff hard at work in the medium-term storage room of the International Rice Genebank at IRRI. “For years, gene banks were primarily repositories, but with genetics evolving, and its subsequent application in plant breeding growing over the past 10 years, breeders and geneticists are now mining gene banks for wild and exotic species that might have favourable genes for desired traits,” explains Ruaraidh Sackville Hamilton, evolutionary biologist and head of the International Rice Genebank maintained by the International Rice Research Institute (IRRI) at its headquarters in The Philippines. Sifting through all these gene-bank collections for plants with desired traits is challenging for breeders, even for traits that are easy to select for through visual screening. For example, Ruaraidh says the rice collection held at the International Rice Genebank contains more than 117,000 different types of rice, or accessions. In recognition of this challenge, the initial rationale of the CGIAR Generation Challenge Programme’s (GCP) genetic stocks activity was to make the diversity in gene banks more easily accessible and practical for the study – and application – of genetic diversity. The first step towards making diversity accessible to breeders was to develop reference sets, representing as much genetic diversity as possible within a small proportion of gene bank accessions, selected through pedigree and molecular marker information. “Reference sets reduce the number of choices that breeders have to search through, from thousands down to a few hundred,” says Jean Christophe Glaszmann, a plant geneticist at France’s Centre de coopération internationale en recherche agronomique pour le développement (CIRAD; Agricultural Research for Development), who held a managing role at GCP between 2004 and 2010, overseeing much of the reference-set work as GCP’s Subprogramme Leader on Genetic Diversity during GCP’s Phase I. During the first phase of GCP (2004–2008), the Programme focused on identifying and characterising reference sets, each of roughly 300 lines, for banana, barley, cassava, chickpea, coconut, common bean, cowpea, faba bean, finger millet, foxtail millet, groundnut, lentil, maize, pearl millet, pigeonpea, potato, rice, sorghum, sweetpotato, wheat and yam. For most crops phenotyping data – information about physical plant traits – were also being made available for the reference sets, helping researchers to select material of interest for breeding. A trainee at the International Maize and Wheat Improvement Center (CIMMYT) shows off diverse wheat ears, a small sample of the thousands of different lines found in the centre’s gene bank. A further aspect of the work was the development of data-kits, which included molecular markers used to genotype and verify the sets. These kits allow plant scientists to assess and compare the diversity of their own collections with that of the reference sets, thus facilitating the introduction of new diversity in their prebreeding programmes. During the second phase of GCP (2009–2014), the reference sets for GCP’s Phase II target crops (cassava, chickpea, common bean, cowpea, groundnut, maize, rice, sorghum and wheat) were thoroughly phenotyped under different environments, including biotic and abiotic stresses. Jean Christophe says this work helped to identify new alleles (alternative forms of a gene or genetic locus) associated with desired traits that could be used for breeding purposes. Reference sets have been used successfully to identify and use new plant material in breeding programmes to improve various traits, particularly disease resistance and even more complex traits such as drought tolerance in cassava, chickpea, cowpea, maize, sorghum and wheat. 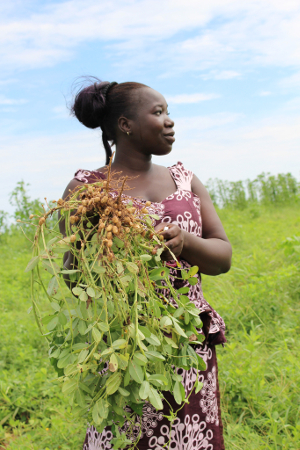 A farmer in Senegal shows off her groundnut crop, almost ripe for harvest. Another objective of GCP’s genetic stocks activity was to create new diversity within domesticated cultivated crops that have narrow genetic diversity, such as groundnut. This genetic similarity means that all cultivated groundnuts are very susceptible to diseases, particularly leaf spot, requiring expensive agrochemicals, especially fungicides. Without agrochemicals, which smallholder farmers in Africa and Asia often cannot afford, yields can be very low. David says groundnut breeders always recognised the need to increase diversity, but because cultivated groundnuts have had a narrow base for so long, they became radically different from their wild relatives, making it very difficult to successfully cross wild species with cultivated species. New genetic diversity is created through recombination, that is, through crossing contrasting varieties to create novel lines. Researchers can study these recombinants to identify genes associated with desired traits or use them in further crosses to develop new varieties. David says this painstaking work, carried out under GCP, also formed the platform for sequencing the groundnut genome for the first time. “That gave us an even greater understanding of the genetic structure, which is laying the groundwork for new varieties with traits such as added disease resistance and drought tolerance,” says David. An additional key outcome of the groundnut aspect of the Legumes Research Initiative was developing ‘wild × domesticated’ synthetic lines, which are being crossed with domesticated groundnut varieties in Malawi, Niger, Senegal and Tanzania to introduce higher drought tolerance. 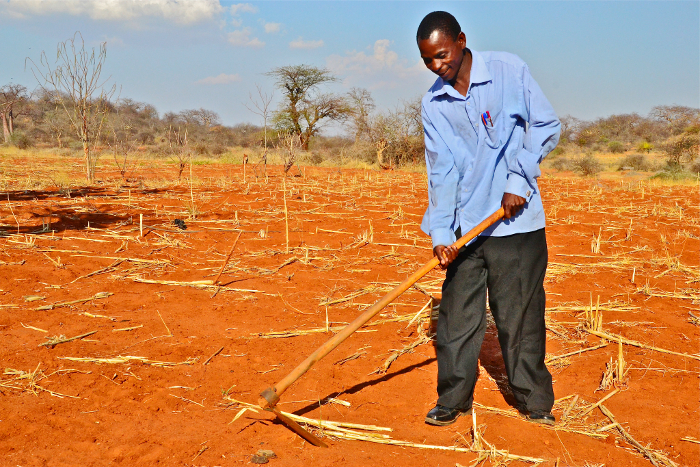 Like many areas of Africa struck by climate change, this village in Tanzania is suffering the effects of drought, with temperature increases and increasingly unpredictable rainfall. The genetic stocks activity has generated a large and diverse array of resources across GCP’s target crops, not just for groundnut. Recombinant inbred lines (RILs) incorporating specific traits of interest – particularly drought tolerance – have been developed for cowpea, maize, rice, sorghum and wheat. RILs are stabilised genetic stocks, created over several years by crossing two inbred lines followed by repeated generations of sibling mating to produce inbred lines that are genetically identical. These can then be used to discover and verify the role of particular genes and groups of genes associated with desired traits. Near-isogenic lines (NILs) are RILs that possess identical genetic codes, except for differences at a few specific genetic loci. This enables researchers to evaluate particular genes and groups of genes that they may want to incorporate into breeding lines, particularly genes that have come from plants that otherwise do not perform well agronomically, such as wild relatives or older varieties. Sorghum NILs incorporating the AltSB locus for aluminium tolerance are being tested in Burkina Faso, Mali and Niger on problematic acid soils. Multiparent advanced generation intercross (MAGIC) populations are a form of recombinants developed from crossing several parental lines from different genetic origins and, in some cases, exotic backgrounds to maximise the mix of genes from the parental lines in the offspring. MAGIC populations have been developed for chickpea, cowpea, rice and sorghum, and are being developed for common bean. Selected parental lines have been used to combine elite alleles for simple traits such as aluminium tolerance in sorghum and submergence tolerance in rice, as well as for complex traits such as drought or heat tolerance. 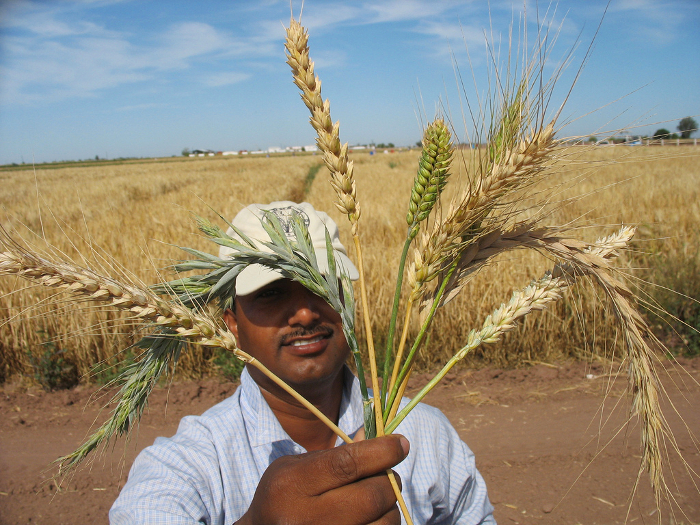 The further evaluation and use of the genetic stocks stemming from GCP-supported projects, as well as the generation of new genetic stocks, will continue beyond GCP through CGIAR’s Research Programs as well as through those institutes and national breeding programmes associated with GCP. There will be a continuing and evolving need to identify new genes associated with desired traits to improve cultivated germplasm. Transplanting rice plants in Myanmar. Sustainability of genetic stocks has always been an issue, as stocks are generally not managed in a centralised way but are left under the direct responsibility of the scientists who developed them. These resources have therefore usually been handled in a highly ad hoc manner. Because of high staff turnover in CGIAR Centers and breeding programmes in developing countries, and also because their management is neither centralised nor coordinated, these resources are also often lost as staff move from one organisation to another. Although different genetic resources require different management protocols and storage timelines, the idea that gene bank curators take on the management of genetic stocks was proposed several years ago. For Centers such as IRRI, this is already a reality – for at least some of the genetic resources developed. However, with the growing popularity of tapping into the rich diversity in gene banks that GCP’s genetic stocks activity has helped drive, gene bank supervisors such as Ruaraidh Sackville Hamilton are concerned about how genetic stocks will be sustained. “The more popular molecular breeding and genetic stock become, the more funds we need to help us curate and disseminate them,” says Ruaraidh. He proposes to recover costs for managing genetic resources through a chargeback system on a two-tier scale, with non-profit organisations receiving stock at lower costs than commercial organisations. “Such a system would be sustainable and reduce the burden on gene bank institutes,” he says. Still, the costs are of concern to institutes, particularly CGIAR Centers, which maintain most of the world’s plant crop gene banks. 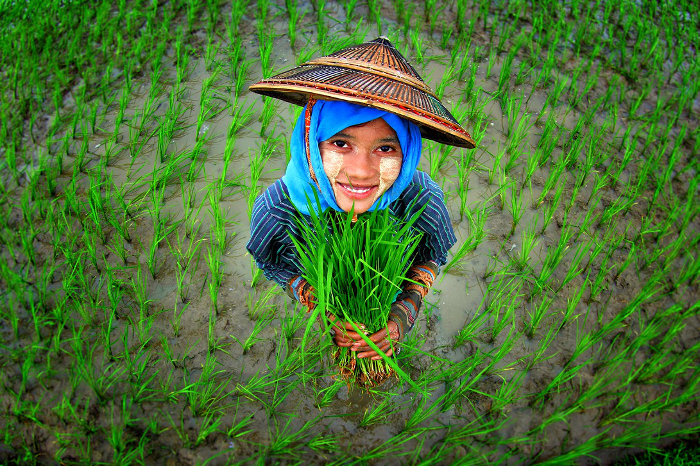 CGIAR, a global partnership that unites 15 research Centres, including IRRI, is engaged in research for a food-secure future. CGIAR also created GCP. “CGIAR’s main priority is to conserve genetic resources for all humankind,” says Dave Hoisington, Senior Research Scientist and Program Director at the University of Georgia in the US. He was formerly Director of Research at the International Crops Research Institute for the Semi-Arid Tropics (ICRISAT) and Director of the Genetic Resources Program and of the Applied Biotechnology Center at the International Maize and Wheat Improvement Center (CIMMYT) (both CGIAR Centers) and Chair of the GCP Consortium Committee. At work in the maize active collection in the gene bank at CIMMYT, which keeps maize and wheat diversity in trust for the world. 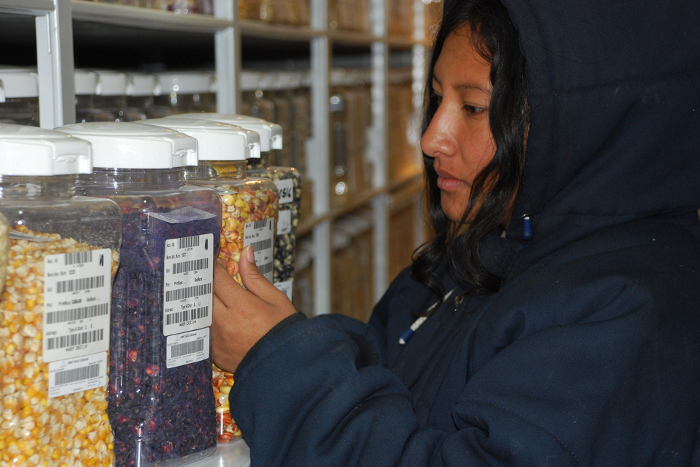 To alleviate some of the funding burden on CGIAR Centers and free up more money to use in research and development, CGIAR created a new CGIAR Research Program for Managing and Sustaining Crop Collections. The comprehensive five-year programme is managed by the Crop Trust (formerly Global Crop Diversity Trust). The new programme is also reviewing how gene banks within CGIAR are being managed, with a view to developing a quality management system, which it hopes will make gene banks run more efficiently. Charlotte says it is also encouraging stronger gene banks, such as IRRI and CIMMYT, to lend their expertise and experience to smaller gene banks so they can meet and build on their management quality. Dave Hoisington believes that the new programme will provide CGIAR’s gene banks with greater capacity and make them even more attractive for researchers wanting to make use of their rich diversity. 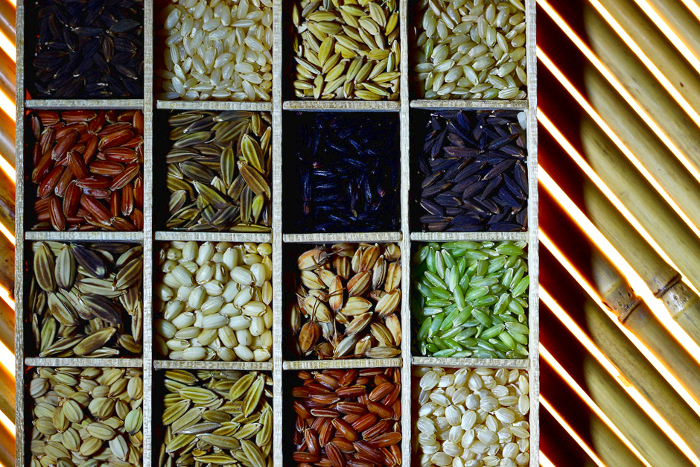 A wide diversity of rice seed from the collection of the International Rice Genebank at IRRI. Tapping into new diversity was really at the heart of GCP, and was a major, if not the primary, rationale for its establishment. Over its 10-year lifespan, has invested almost USD 28 million, or 18 percent of its budget, in developing genetic stocks, both reference sets and recombinants, for over 20 different crops. Although these products don’t directly benefit farmers, they do indirectly help by significantly increasing breeding efficiency. “All this research is fairly new and I am amazed, as a geneticist and plant breeder, by how far we’ve come since GCP started in 2004,” says David Bertioli. GCP’s genetic stock activities have generated a large and diverse array of resources. These resources lay the foundation for further genetic stock development and will aid in researchers’ quests to tap into genetic diversity well into the future.